Provides more Legion content by adding or expanding several Legion quests. All fully voiced using audio files from the game. File of the month August 2015! 2. Make an existing Legion quest bigger and more interesting. In addition, this mod adds 2 entirely new Legion quests, and integrates some (originally non-Legion) vanilla quests into the main Legion questline "Render unto Caesar". 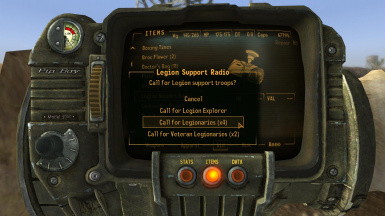 One of the new quests provides the player with a Legion Support Radio which the player can use to call in Legion troops as reinforcements, similar to the vanilla NCR Emergency Radio. Every piece of dialogue is fully voiced using audio files from the game. Often spliced, but never in a way that you will be able to hear it. The quests That Lucky Old Sun (HELIOS One), Birds of a Feather (Van Graffs), How Little We Know (Omertas), and We Are Legion (taking over Forlorn Hope) are altered, to either expand them or provide an option to complete the quest in favor of the Legion. One involves meeting up with Cato Hostilius to assassinate Chief Hanlon, the leader of the Rangers. The other is a side-quest that involves taking down the various Ranger Stations. The player also receives a Legion Support Radio that can be used to call in Legionaries as followers that assist you in combat. That Lucky Old Sun can now be started through Render Unto Caesar. 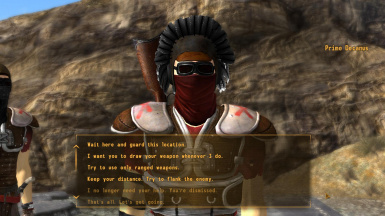 Caesar will instruct the player to eliminate the NCR garrison at HELIOS, possibly by activating Archimedes I. Legionaries will then take over HELIOS One like in vanilla. How Little We Know can now be started through Render Unto Caesar. 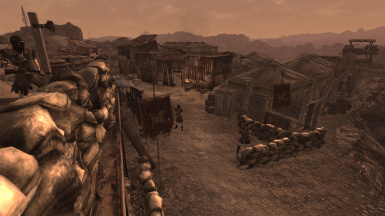 The player will be asked to make sure that the Omertas will carry through their plan to attack the Strip. 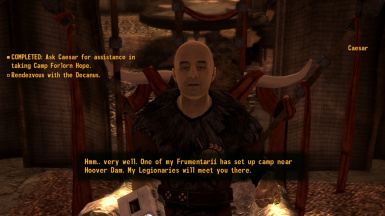 New dialogue options with Big Sal regarding the plan and his cooperation with Caesar are available. 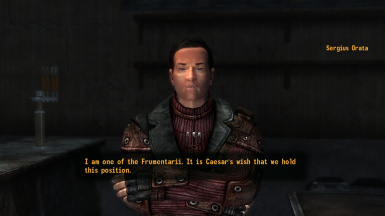 Note that starting this quest via Caesar makes it impossible to complete the quest by helping Cachino, as Big Sal finds out about Cachino's treachery before the quest starts. Through Render Unto Caesar, the player can start an entirely new quest in which he/she meets up with Cato Hostilius to kill Chief Hanlon. 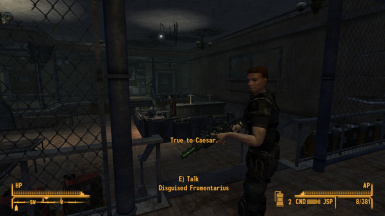 If, before or during the quest, the player finds out about Hanlon's activities through the quest Return to Sender, the player can discuss this with Caesar. 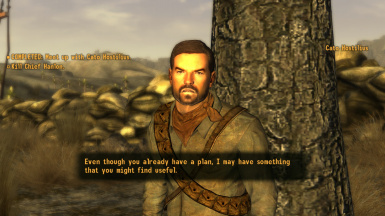 Cato's dialogue is also changed to reflect whether or not the player has met him before when doing either the new quest or Arizona Killer. 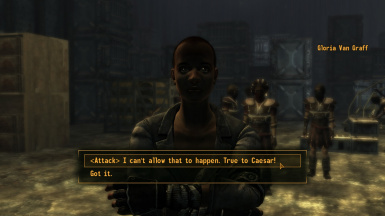 Caesar can be convinced to spare the Brotherhood of Steel for the moment. 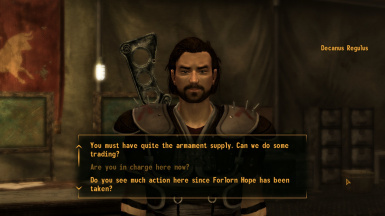 To do so, the player must complete the BoS quest "Still in the Dark", after which the player can convince the Elder (either McNamara or Hardin) to attack HELIOS One when the battle for Hoover Dam starts. 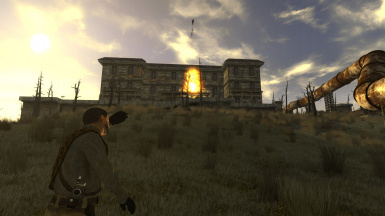 Once the player has convinced the Elder to do so, the player can return to Caesar and inform him of this attack, upon which he decides to spare the Brotherhood for now. Choosing this route will also be reflected in the BoS ending slides. 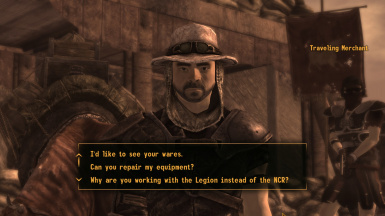 Birds of a Feather now includes extra dialogue options with the Legion contact, and when the big deal goes down, you can help the Legionaries when they're attacked by the Van Graffs and the NCR. You will receive a reward from the Decanus, and afterwards disguised Frumentarii will take over the Silver Rush. As long as the player remains an ally to the Legion, he will be able to purchase energy weapons from the Frumentarii at the Silver Rush. A laser rifle will also be added to the list of weapons a veteran Legionary and the (prime and veteran) Legion reinforcements can spawn with. 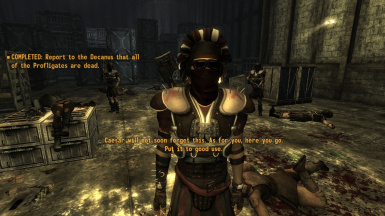 In We Are Legion, instead of just killing some NCR and being done with it, Dead Sea now redirects the player to Caesar to ask for extra Legionaries to help capture Forlorn Hope. 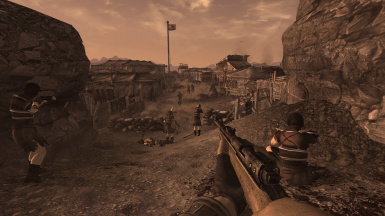 The player then meets up with them and attacks the camp. I also changed the reward the player receives from Dead Sea; instead of a unique Machete, the player gets a unique Machete Gladius (so it's a less useless reward). 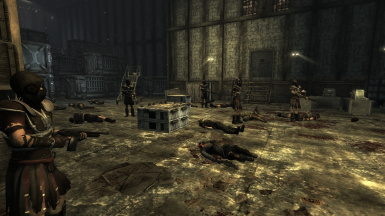 48 hours after capturing the camp, the Legion will send extra men to actually occupy the camp, which didn't happen in vanilla. 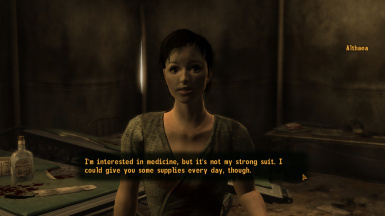 The player can then trade with the Decanus that helped in the attack (if he survives), a bunch of Legionaries will patrol the camp, some NCR troops will get crucified, NCR flags will be replaced, and the player can get medical attention and special healing powder from a doctor/slave in the Medical tent. Several traveling merchants, escorted by Legionaries, will also be added. They move from Forlorn Hope - Nelson - Novac - Cottonwood Cove. 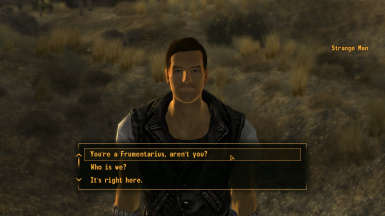 A new quest that can be started by talking to Caesar after dealing with the Securitron Vault. 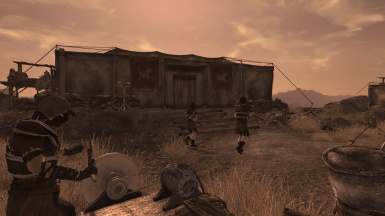 Caesar gives the player written orders to eliminate the NCR Ranger Stations around the Mojave, and provides him with a Legion Support Radio which can be used to call in Legionaries as followers to help you in combat. Legion support troops can only be called in inside Legion-controlled territory (except the Fort). This region initially consists of the areas around Cottonwood Cove, Nelson, and Nipton. 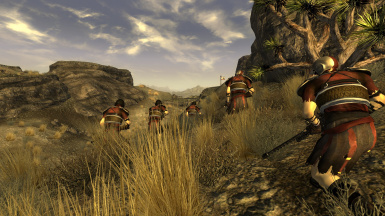 The region in which support is provided can be expanded to include the area around Forlorn Hope by completing We Are Legion, and the areas around the various NCR Ranger Stations by completing Long Distance Call. The player's Legion reputation determines the type of support troops that the player can call in. Furthermore, the equipment and stats of these support troops vary depending on the player's level. The support troops do not automatically get fully healed when combat ends (like companions do). However, they do carry a number of pouches of healing powder, which they consume to restore their health both in and out of combat. The more experienced the Legionary, the more healing powder he spawns with. - Each support troop can be given orders by talking to them, and have voiced responses to the orders: wait here, sync weapon drawing, change combat style preference, change follow distance, or dismissal. Alternatively, they can be dismissed by using the radio. I also added several lines of combat dialogue to the support troops, conditional on the enemy you're fighting, and I restricted their dialogue in such a way that they do not bark their lines at the same time. - Support troops have a cooldown that lasts until the end of the day they're dismissed (until 24:00), similar to the NCR Emergency Radio. - The Ranger Stations are not occupied by Legionaries after Long Distance Call. Instead, the Rangers respawn, because I wanted the player to have a few places where they could always go to kill some Rangers. - "Don't Tread on the Bear!" will only fail after dealing with the White Glove Society. 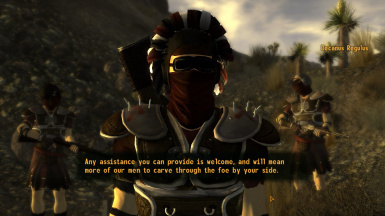 In other words, the player can complete all the new quests integrated into Render Unto Caesar without being branded a terrorist by the NCR. - Completing any of the "integrated" quests before receiving them from Caesar is not a problem. You just won't receive any Legion fame by completing them, as they will not be a part of Render Unto Caesar. 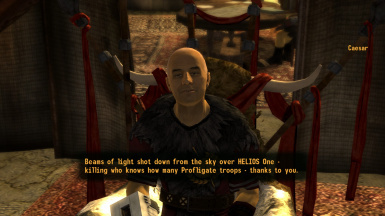 For example, if you already completed How Little We Know when returning to Caesar after dealing with HELIOS One, the player will just go straight to the Hanlon Assassination quest. - If you have already completed Render Unto Caesar up to or beyond the part where you deal with the White Glove society, the quests That Lucky Old Sun and Sh-Boom! can still be started by talking to Caesar. - You can also convince Jean-Baptise that Cass is dead through a relatively difficult Speech check. - If Regulus dies, his replacement won't trade with you. He does not die easily, though. - The Legion vendors (especially Regulus) don't generally have a lot of caps, but they do have Legion Aurei/Denarii. So if you're selling, you may want to trade for Legion currency. - The vanilla bug causing Silver Rush inventory to not restock is fixed when the Legion takes over. - This mod uses some functions from the JIP LN NVSE Plugin, but I put these in a separate script, so it's perfectly fine if you do not use this NVSE plugin (or NVSE at all). The only difference is that the faction reputation associated with the Forlorn Hope map marker won't change to that of the Legion when it's captured. Just drop the .esp and Sound folder into you Data folder and tick the .esp with your mod manager of choice. You don't need to start a new game for this mod or anything, you can enable it at any time. However I don't recommend activating this mod on a save that's in the middle of We Are Legion, due to how drastically it's been changed. A save in which it's already completed/hasn't been started should be fine. If you activate this mod on a savegame in which We Are Legion has already been completed, the Legion will take over Forlorn Hope after 48 hours. I could add a script to reset the quest if it's already in-progress upon load, but this will probably cause more problems than it solves (e.g. when updating), and the Say Once flags on dialogue don't get reset anyway. Just replace the files. That's it. Do not try to do a ''clean save'', i.e. deactivating the mod, loading the game and saving, then re-activating the mod. This will just screw up the quests. It's compatible with Caesar's New Regime and should be compatible with any other armor/weapon mods. The latest version is also compatible with the mod Novac Legion Quest. I generally go out of my way to not change anything vanilla unless I have to. 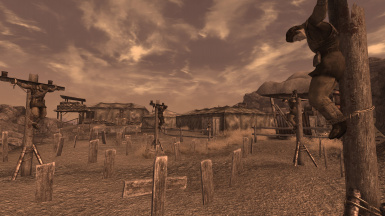 NPCs: Caesar, the Van Graffs, Big Sal, any of the NPCs in the BoaF warehouse, reference IDs of the Forlorn Hope NPCs, NPCs around the Ranger Stations, Chief Hanlon's AI Packages. For a complete overview of everything changed, use FNVEdit. When in doubt, load this mod last, because quests tend not to work if another mod overrides the necessary scripts. then the most likely cause is some kind of mod conflict. Move this mod to the bottom of your load order, load a save game before the problem occurred, and try again. If the problem persists and you're quite sure it isn't a mod conflict, inform me and I'll look into fixing it. Changed Dead Sea's dialogue tree so that this mod is compatible with the mod Novac Legion Quest without requiring a patch. Added another new quest that allows the player to call in Legion support troops. Added the option to complete the Omertas' quest in favor of the Legion. Integrated several quests into Render Unto Caesar. Added the option of sparing the BoS. Fixed issue causing the player to be unable to complete Tend to Your Business after finishing Birds of a Feather by helping the Legion. 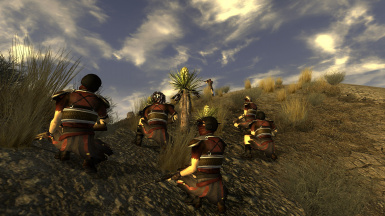 Increased the amount of NCR troops to fight when the player takes over Forlorn Hope in We Are Legion. Added extra failsafes to ensure the Decanus talks to the player at the end of Birds of a Feather. Added a new quest that can be started by talking to Caesar after completing That Lucky Old Sun. Fixed issue causing the player to be unable to continue/start quests when he/she is at the end of the Legion's main questline.